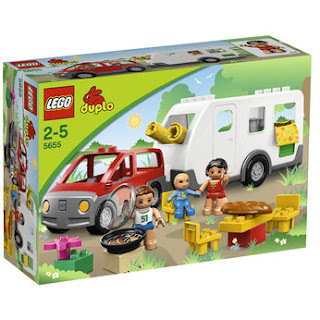 As some of you may know, last year Mister A was lucky enough to be chosen as one of 20 Lego Duplo Experts and over the course of the year we will hopefully be reviewing lots of lovely Duplo. I particularly love that the set comes with sleeping bags - a lovely little touch. When they've had enough for the day they can head back in to the caravan for a good nights sleep. 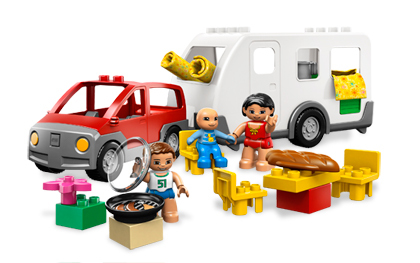 At £30.99 it's quite pricey, but it's a great little set with 21 pieces in total and you know that when you buy Duplo it is built to last (we still have Duplo from 20 years ago when we were younger!) Mister A seems to enjoy playing with it on every occasion and loves deciding where the family are going on their holidays - sometimes they go alien hunting, sometimes they go to France - make of that what you will! So Mister A - thumbs up or thumbs down? Overall, we love it and we would recommend - although we'll be buying more Duplo so that Mister A can build some new places for the family to visit.